All transactions are safe and secure with a reliable history in online purchasing behind each of our associates. 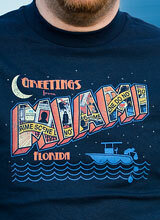 Buy the Greetings from Miami t-shirt to own Dexter clothing and merchandise. Greetings from Miami, the home of Dexter Morgan who is the city's crime fighting serial killer. This shirt offers an impressive postcard style design that brings together well-known elements from the Showtime TV show. Filling the letters are drawings of Dexter's weapons, his syringe, a silhouette of the Dark Defender and an image of the Miami Chills ice delivery truck. Fellow fans will enjoy exploring the design for more trademark Dexter elements. Of course, we can't ignore the blue silhouette of the Slice of Life boat near the bottom. In addition to the Greetings from Miami tee above, browse the Dexter Clothing Gallery for more apparel like men's and women's clothes, kids shirts or hoodies.